Baseball lost one of its most beloved members yesterday, in Kirby Puckett, at the young age of 45. He played his entire 12 year career for the Twins, an organization that means a lot to my friend Nate. His career was cut short due to health problems, much like his life was yesterday. He will always be remembered for having a smile on his face and such a positive outlook on life. Kirby touched many baseball players and fans throughout his time in the league, not just on the Twins or in Minneapolis. He will be remembered for what is one of the most famous homeruns in World Series history, taking the Twins to a game 7 against the Braves is 1991. There were certainly a few dark moments in his life after Kirby was inducted into the hall of fame in 2001, but the good memories of him will always live on. 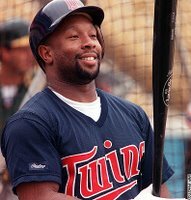 Let's take a moment and remember Kirby Puckett, with his contagious smile and the way that he was able to inspire kids to play the game of baseball.